Is there a God? Is the Bible true ? Did the Exodus really happen ? YES, the Exodus really happened; YES, the Bible is true; and YES there is a God. The evidence shows that God is the God of the Bible, the true God of heaven and earth. Such an incredible, bold, blatant statement requires equally incredible, bold, blatant, evidence. Here is the bold, powerful, dramatic evidence which is supplied by God himself, directly, incredibly, personally. Exactly where the Red Sea parted has been of great debate. Contrary to many incorrect theories, numerous scripture details match just one place. Where and how the Exodus Red Sea parted is shown below. The historical Exodus account says God parted the Red Sea by a strong east wind when Moses stretched out his hand over the water. Those who listened to God were freed and saved while the proud, greedy, brutal, idol worshippers drowned. Unique, curious, geographic features point to the ‘BOW Inlet’ as the special place where the sea parted and the Israelites crossed. The Bow Inlet was a curve in the Red Sea near the lower Suez Canal. This writeup discusses interactions between the spiritual and material realms where the Exodus information sits as a gateway to other highly relevant items today from Genesis, Exodus, The Prophets, Psalms, Daniel, the Gospels and Revelation. When viewing everything, there appears to be a new illumination of understanding occurring using revelations already given from God in scripture, containing a great quantity of information. 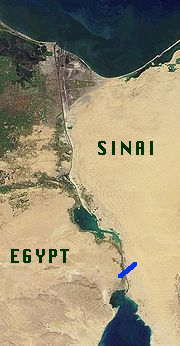 Left: The blue line is where Pharaoh's army drowned, sank to the bottom, and has been found covered by the sand at the Lower Suez Canal. This area was called the Heroopolite Gulf or Red Sea in ancient times. 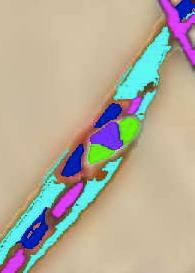 Right: A false color, close-in small portion, 1.4 mile (2.26 km) piece, 1/7th of the full 9.8 mile long (15.8 km), 300 feet (91m) wide, front line of Pharaoh's Army as found under the sand by Satellite Ground Penetrating Radar. Similar sections are spread for a full ten miles of the army's line. In both pictures Pharaoh's army's broad front line was advancing toward Moses and the Israelites from the upper left corner toward the lower right. See correct full-color image and explanation here. This, and other new evidence is not yet incorporated into the narrative below. The major corrections to be made are: 1, the Red Sea covered the army very high and only once; and 2, Succoth's map location should be about midway on Wadi Tumilat, the Canal of the Pharaohs. Below are 35 page links about the parting of the Red Sea. At the bottom one single link goes to the entire 35 page .pdf document for easy scrolling. Page # Pages 1 & 2 for introduction, but the most interesting pages begin at page 11. Pages from about 2 - 10 are summaries to debunk incorrect crossing sites. 1 Introduction: What is a good criteria to find the correct Red Sea crossing place? 36 God’s Greatness Discussion to be added. Old complete .pdf of entire Exodus Red Sea Crossing discussion. approximately 50 Mb. NEW complete .pdf of entire Exodus Red Sea Crossing discussion. approximately 85 Mb. The old and new complete .pdf documents directly above will take a very long time to download if you have a slow internet connection.